After our unexpected Thanksgiving snowfall, I spent Black Friday hitting up a few local spots. Things were quiet everywhere. Maybe the birds were as surprised as we were! Farmers hadn’t had time to spread manure yet, so the fields glittered in the sun while a few sparrows foraged for weed seeds. 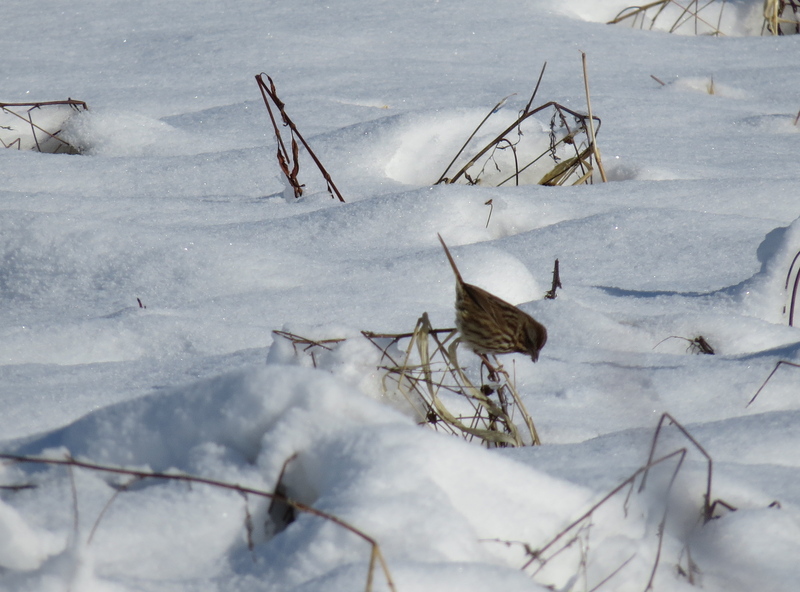 This Song Sparrow and a half-dozen friends dipped in and out of the snow under the watchful eyes of a late-lingering American Kestrel. Even more than shorebirds, sparrows are… challenging. (Yeah, let’s use that word. It’s politer than most of the others that crossed my mind.) Not only are they predominantly brownish, they have the infuriating habit of popping out of cover, flying 10 feet, and disappearing again making a few indistinguishable cheeps. So I was glad this little guy flitted in tho the edge of my neighbors’ veggie patch, showing a flash of white tail feathers. And he found enough goodies to stick around for the time it took me to dig out the camera and fire off a few shots.